In my last posting I claimed that rocket scientists and mathematicians would make good bakers as baking is a very exact science. I still believe this, but I am now willing to acknowledge that anyone can bake, so long as a strict adherence is paid to the recipe. And herein lies my problem…. I do not follow directions well. I still remember, with perfect clarity, an incident when I was in the first grade when Mrs. Peters disciplined me for not following directions on an art project. Rather than precisely coloring within the outlined picture as instructed, I haphazardly colored in the picture as I wanted to be the student who finished the project first. Unfortunately, I never learned the lesson in first grade, and this scenario, with different facts, has been played on repeat throughout my life. Perhaps the humiliation, yes humiliation, I faced in Mrs. Peter’s class has transcended my life and I have since shied away from projects requiring an attention to detail…like baking. Fortunately, 25 years later, I am now taking on baking-related fears and learning, that with discipline, baking a German Chocolate cake is well within my reach. 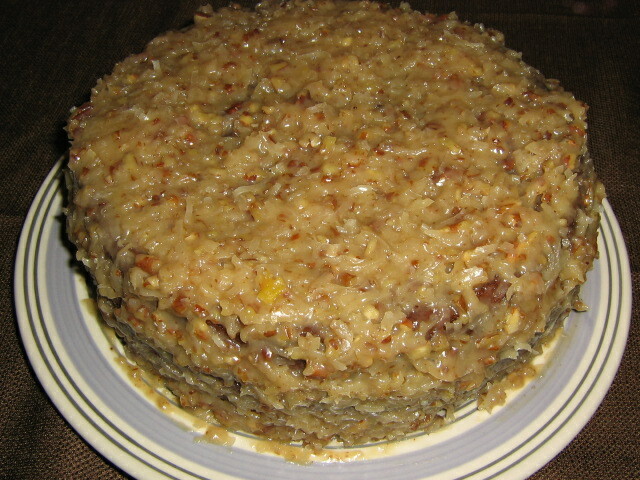 On Monday, I made a German Chocolate Cake for George’s birthday, and I have to say, it was the best cake I have ever had. Seriously. Using my kitchen bible as my guide, The Fannie Farmer Cookbook, I methodically worked through the cake’s recipe and made a cake from scratch. With all the cooking I have done over the years, I have never made a proper cake – one that is layered with home-made frosting – from scratch. And for George’s birthday, I wasn’t going to sell myself short with a boxed cake…even though the temptation was great. Having a lot of trust in Marion Cunningham and her epic cookbook, I got baking. Diligently following the recipe, I completed the first several steps with ease. I successfully preheated the oven to 350 degrees, I greased my cake pans and even cut out perfectly symmetrical circles of wax paper to line the bottom of my greased cake pans. I was on a baking roll! As my confidence started to build, I carefully melted 4 ounces of Baker’s German sweet chocolate and let it cool, I creamed the butter and sugar until fluffy and even added the egg yolks to the butter and sugar mixture one at a time without incident. Well, I had one egg casualty, but it did not compromise my cake…just our floor. Reading and re-reading the recipe verbatim, I blended the vanilla and melted chocolate and began to slowly add the dry ingredients. It was at this point that I began feeling really good about my skills and suffered a baking relapse. I stopped reading each word of the recipe. And oh yes, words matter. I finished mixing in all of my dry ingredients and my batter was smooth. The only remaining step was to fold in the egg whites and without thinking too much into it, I dumped my bowl of egg whites into the batter and watched them spread across the batter like balsamic vinegar touching olive oil, a reaction I was not expecting. After a wave of emotion passed that started with confusion and ended with utter rage, I reread the recipe. “Fold in beaten egg whites.” Hmph. I read, ‘fold in egg whites’, not, fold in beaten egg whites. Folding in beaten egg whites is critical for German Chocolate cake. 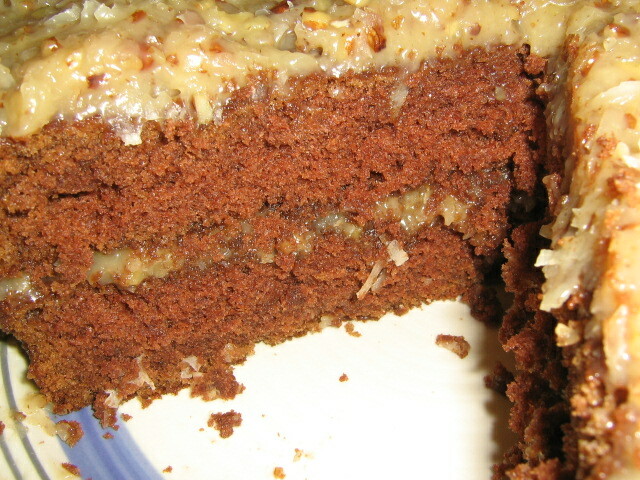 A German Chocolate Cake, while decadent and rich, is supposed to be fluffy and light. Beating an egg white allows the protein in the egg white to expand, which in turn will give a cake more volume…hence the fluffy and light characteristic of German Chocolate Cake. Since I did not beat my egg whites, as the recipe instructed, and not wanting to start over, I decided to beat the whole batter, with the incorporated egg whites, for about a minute on the highest setting of my Kitchen Aid thinking that maybe the eggs’ protein would expand. While it seemed at times that my Kitchen Aid was about to launch itself off the counter because it was going so fast, the method really worked. I frosted the cake with the traditional coconut and pecan icing and enjoyed a very fluffy, very light and very tasty German Chocolate Cake. The fluffy German Chocolate Cake! So while my lack of attention to recipe details did not ruin the cake this time, I did learn an important baking lesson. A methodical baker is a successful baker. Preheat oven to 350 degrees. Butter and flour three 9-inch round cake pans. Line the bottom of the pans with buttered wax paper. Melt chocolate in boiling water. Cool. In a mixing bowl, cream butter and sugar until fluffy. Add yolks, 1 at a time, beating well after each addition. Blend in vanilla and chocolate. Mix the flour with the soda and salt, then add alternatively with buttermilk to chocolate mixture, beating after each addition until smooth. Fold in beaten egg whites. Pour into the three prepared pans. Bake for 30-35 minutes. Cool in the pans for 5 minutes before turning out one to a rack to cool. Frost only the tops with frosting. In a saucepan, mix the evaporated milk, sugar, egg yolks, butter and vanilla. Cook and stir over medium heat until thickened, about 12 minutes. Stir in the coconut and pecans. Cool until thick enough to spread, beating occasionally. You will have enough to fill and frost a 9-inch three layered cake. This entry was posted on December 4, 2008 at 6:01 pm and is filed under California Produce, Recipe Ideas. You can follow any responses to this entry through the RSS 2.0 feed. You can leave a response, or trackback from your own site. I love the culture and detail in your posts – cake looks great also!